I have run into a number of simple effects to generate image magnification. 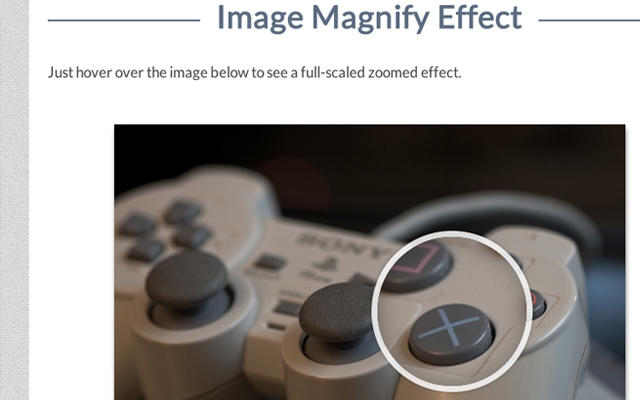 You can sometimes find this on e-commerce websites for product images when you hover onto the thumbnail and a bigger zoom effect will display. This is a great technique no matter what type of website you have. But I was running into a lot of trouble with plugins, and then I managed to find this excellent tutorial on The Code Player. All of the source codes are released in a repository on Codepen.io which also has a lot of follow-up discussion. I was very impressed with the codes and I wanted to organize everything a bit better. So in this tutorial I want to demonstrate how you may customize this basic JS code to work for any image on your website. The jQuery is structured for targeting a specific class of images on the page and then displaying the full view when hovered. I’ll explain the most important bits in greater detail. We do not need to worry about much HTML in the layout. I am using a standard HTML5 doctype along with a local copy of jQuery 1.9.1. Also I’ve taken the time to copy over all of the JS code into a new file called magnify.js. There should not be many areas which require editing so it helps to organize everything separately. The image area block is encapsulated inside a div with the class .magnify. You’ll find an empty div area using the class .large which contains the magnifier object. All of the width/height features are created in CSS which looks a lot better in almost every browser. 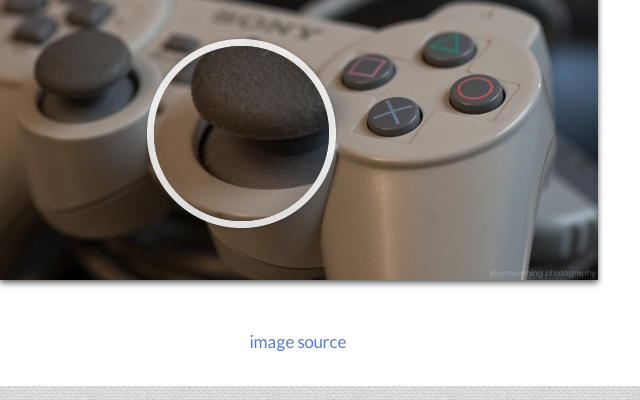 Then I have renamed the image class to .thumb so it is easier to recognize. This is probably the most important code in your document since it all requires some effects via jQuery. And the selector objects will be looking for these exact classes. The only custom addition .imgbox is a container I added onto the image to keep it centered within the layout. It is also important to recognize I am linking directly to the fullsize image in the src=”” value. This is crucial because the hover effect only works if we have a full-scale image resized via width and height attributes. To fit the main container I am using margin: 0 auto along with a custom background tile from Subtle Patterns. Now the internal image is using a series of box shadows which are not visible in the magnifying glass. This is a fairly straightforward process and since we are pointing to the same URL in the image file, it makes a lot more sense. But you can get a better idea from checking out my live sample demo below. To reiterate again these are not my own codes, but were originally published elsewhere in a related tutorial by Ruby on Tails. All of his codes are released as free and open source for other developers. I simply took this base and configured it to work in a nice layout, along with any typical images you choose. But please take a peek at my sample demo and download a copy of the project codes if you want to try out your own custom edits. I did go through at least 3 different jQuery magnify hover plugins before finding this gem in Codepen. I feel the magnification effect is not given enough credit in modern web design. And taking user experience into deep consideration, this effect is worth implementation when it can improve your overall website style. Please do check out my live sample demo or visit the main tutorial page if you want to research a bit deeper.